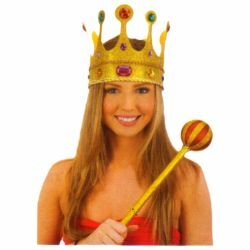 The gold glitter queen’s crown is a great finishing touch to almost any queen costume. The crown is made of soft foam covered in glitter and gem stones. The glitter royal crown is colored as pictured. Hat is one size fits most using the Velcro size adjuster.